Joe Anderson who recently began writing articles for Ghacks send me a message two days ago asking what I thought about Twitterfeed and I had to admit that I never heard of that service before. He let me know that webmasters could use Twitterfeed to publish RSS News Feeds on Twitter. What it does is that it checks the provided RSS News Feeds regularly and posts new items to a Twitter account. That's the basic principle at least. Users need an Open ID to log into the service and a Twitter account to publish the RSS News Feed to. It basically works like this. The user creates a new account at Twitterfeed using an Open ID account. He can then create a new Twitter Feed to the account by supplying a Twitter account and a feed url of the feed that he wants to add. Once that has been setup Twitterfeed will publish new items on the Twitter account automatically until the user pauses or deletes it again. The feed is not authorized which means that anyone can post any feed to Twitter which could be interesting for some users who would like to post a number of feeds to a Twitter account. 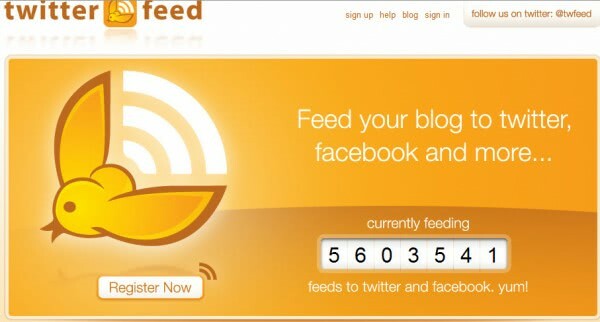 A number of feeds? The number of feeds that can be published does not seem to be limited which in effect means that someone could create a new Twitter account and publish all of his favorite RSS News Feeds to it. This could be useful if access to RSS News readers is limited or blocked in a network while access to Twitter is not. It could also be a nice service that webmasters could offer their readers. Spam could be a issue on the other hand. I thin they are abusing Twitter by such service. To tell you the truth I cannot imagine myself following someone on Twitter who sends me links to his blog every now and then instead of speaking like humans.